Assistant Minister for Vocational Education and Skills Karen Andrews said the program was a key part of the Government’s efforts to inspire young Australians to take up an apprenticeship and to raise the status of Vocational Education and Training (VET). The program recruits former and current Australian Apprentices as ambassadors from a range of backgrounds who have found career success from their studies and who want to share their career success story through various communication mediums from speaking at schools, to starring in the department’s Real Stories Real Achievements video series. The program’s newest recruit, 2016 Australian Apprentice of the Year, 24-year-old Shane Dealy from Canberra, said he couldn’t wait to start his role as a national ambassador. High profile ambassadors include television host of The Block and carpenter, Scott Cam; AFL legend and former plumber Kevin Sheedy, stylist to the stars, Renya Xydis and many National Rugby League stars past and present. We encourage you to consider opportunities to use these ambassadors to promote Australian Apprenticeships so book an Australian Apprenticeships Ambassador or find out more about the program. Read the media release from the Hon Karen Andrews MP, Assistant Minister for Vocational Education and Skills and view the UNESCO’s Promising Practice Database. Sixteen national competition medallists have been selected to take part in the BBM Youth Support Award for Skilled Futures scholarship to further their training and professional development through work experience in the UK. BBM Youth Support and WorldSkills Australia first partnered in 2000 to grant this scholarship to selected young and talented apprentices and trainees. The $8000 scholarship program is designed to enhance the participants’ career prospects and provide them with invaluable international experience in their respective trades and skills. Typically, awardees spend a minimum of a month in the UK but more often than not stay longer to build their international networks or undertake field trips to other parts of Europe to further their knowledge. WorldSkills Australia General Manager, Brigitte Collins believes that the program provides significant benefit to both the awardees and their employers. “Out of a very strong field of applicants, sixteen of the best have been selected to enhance their knowledge, performance, and productivity to ensure that they have the skills needed to put them in good stead for a successful future. The program will allow them to further develop their skills and techniques to benefit themselves, their workplace and the Australian industry”. Read more on the WorldSkills Australia website. Since 2010, the Australian Government has funded a biennial national survey of international students across Australia’s major education sectors. Of the 6,590 international Vocational Education and Training (VET) students surveyed in 2016, 82 per cent said Australia had been their first choice of location for overseas study. While 87 per cent of the respondents noted their overall satisfaction with undertaking VET in Australia, more than 90 per cent were satisfied with the teaching and learning support strategies of our VET system and 94 percent were satisfied with the career advisory service support they received. Learn more about the VET student responses in the survey infographic. 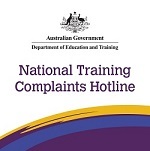 The National Training Complaints Hotline streamlines and simplifies the reporting of complaints for VET consumers including students and other stakeholders. While the service does not directly investigate or address complaints, it connects people with the most appropriate organisation to resolve them. The Hotline is an easy to use and accessible central contact point for VET students to direct complaints about the training sector - that is, complaints relating to their training at the Certificate I to IV, and Diploma and Advanced Diploma levels. The Hotline has become a valuable tool to map trends in the VET sector and to help students who may have training issues preventing them from achieving their best educational outcome. Over 1800 calls have been received since January 2015. Each year, National Skills Week celebrates and informs students and the wider public of the diversity and career pathways available through Vocational Education and Training. With More than you know as this year’s theme, National Skills Week from 28 August to 3 September will showcase the emerging trends and new growth drivers connecting skills training with job outcomes. To register your National Skills Week event or for more information on how you can be involved, go to the National Skills Week website or email SkillsOne. Employers across the nation will be contacted in the coming weeks as part of the Survey of Employer use and views of the VET system to find out how organisations employ and train staff, and how effective this training is at meeting their needs. Managed by the NCVER, the survey aims to collect the views of 9000 employers between now and June this year. Businesses are randomly selected from the Australian Business Register to take part. The survey takes about 10 minutes to complete and gives employers an opportunity to help inform policy and shape future training. The Survey of Employer use and views of the VET system is a biennial survey conducted on behalf of the Australian Government and state and territory governments with funding provided through the Australian Department of Education and Training. Survey results will be published in late 2017. The latest release of apprentice and trainee data show there were 282,900 apprentices and trainees in-training as at 30 June 2016, a decrease of 7.8% from 30 June 2015. The data, published by the NCVER, provides a picture of apprenticeship and traineeship activity nationally and by state and territory. Overall 39,900 people started apprenticeships and traineeships in the June 2016 quarter, a decline of 2.1% compared with the same period last year. This reflects a decline in trade commencements, down 17.3% to 15,900. Non-trade commencements, however, increased by 11.3% to 24,000 over this time. Occupations recording increases include sales assistants and sales persons (up 900); construction and mining labourers (up 400); and carers and aides (up 300). Australian vocational education and training statistics: Apprentices and trainees 2016, June quarter is available on the NCVER website. Financial information on Australia’s government-funded VET system for 2015 shows operating revenues increased 13.6% to $9812.4 million compared with 2014. Released by the NCVER, Financial information 2015, gives an account of the financing of the government-funded VET sector. Government-funded VET is broadly defined as all activity delivered by government providers and government-funded activity delivered by community education providers and private training providers. When comparing 2015 with 2014, revenue from the Australian Government increased by $1446.0 million (46.2%); revenue from state and territory governments decreased by $358.5 million (9.7%); and revenue from fee-for-service activities decreased by $22.3 million (1.9%). Total operating expenditures decreased $433.5 million (5.7%) to $7143.3 million in 2015 compared with 2014. Australian vocational education and training statistics: Financial information 2015 also includes trends for operating revenues and expenditures, operating expenditure activities, assets and liabilities, and state and territory breakdowns. This work, available on the NCVER website, has been produced by the NCVER on behalf of the Australian Government and state and territory governments, with funding provided through the Australian Department of Education and Training. Stephanie Fahey has been announced as the next Chief Executive Officer of the Australian Trade and Investment Commission (Austrade), bringing long-standing experience in business and government both as an academic and executive, domestically and internationally. ACPET has thanked outgoing Chair Mel Koumides for his contribution and welcomed Bruce Callaghan, an experienced director and the former deputy chair and chair of the Board's Governance Audit and Risk functions, to lead the sector through the challenging new policy environment, nationally and internationally. Master Builders Australia’s longstanding CEO, Wilhelm Harnisch, one of Australia’s leading advocates for the building and construction industry and one of its preeminent economists, announced on 1 March that he is stepping down from the role after 15 years at the helm. Nominations are now open for the 2017 Queensland Training Awards — celebrating everyday Queenslanders who achieve success, best practice and innovation through vocational education and training (VET). The prestigious awards recognise those involved in training, including apprentices, trainees, VET students, teachers and trainers, training providers, community-based organisations and employers. Winners may go on to represent Queensland at the Australian Training Awards in November of each year. “The Queensland Training Awards make you understand what you’re capable of and what you’ve already done. 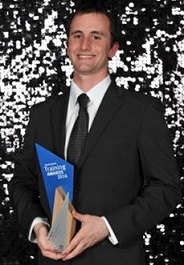 It makes you proud of your life and your achievements, but it also makes you recognise the importance of the people who’ve helped you get there,” says Queensland’s Ben Nedwich, who was named the Australian Trainee of the Year in November 2016. There are two new award categories in Queensland (only) for 2017, the Equity VET Student of the Year and the Community Training Initiative of the Year. For individuals, being involved in the Queensland Training Awards is a unique opportunity to share their success story with peers and professionals, and boost their career. For organisations, the awards can help raise their profile, attract more customers and forge a reputation as an employer, training provider or community-based organisation of choice. Nominations close on 31 March 2017. For more information, visit the Queensland Training Awards. Applications for the 2017 NSW Training Awards are now open! NSW Training Awards celebrate outstanding achievements in vocational education and training by final year apprentices, trainees and students as well as teachers, training providers and employers. APPLY TODAY! Winners may go on to represent New South Wales at the Australian Training Awards in November of each year. For further information on how to enter online please visit the NSW Training Awards website. A team of 23 experts has been selected to train the 2017 Skills Squad in preparation for WorldSkills Abu Dhabi 2017. 24 young men and women were selected to join the Skills Squad following their successful performances at the 2016 WorldSkills Australia National Competition. The team of experts will work closely with these competitors to ensure they develop their skills and, with close to 400 years of combined experience with WorldSkills Australia, the expert team will bring unparalleled knowledge and experience to the Skills Squad. WorldSkills Australia General Manager Brigitte Collins noted this year’s amazing group of experts. The experienced management team will work closely with the experts and the Skills Squad to ensure their training plans gives each competitor the best opportunity to become a 2017 Skillaroo and to help WorldSkills Australia achieve its goal of Australia finishing in the Top 10 against the 75 countries that will compete for the title of world champion in Abu Dhabi in 2017. Visit VET Alumni to be inspired by individual student stories and learn how you can engage with the alumnus. Discover how you can connect with award winning employers who are using VET to improve their business and read about the best Registered Training Organisations in your state or territory. E-Oz and Skills Oz joined forces in November 2016 to deliver the Assuring quality in the National VET system – Change, Challenge, Opportunity conference at the Gold Coast. The highly successful event delivered an informative and diverse three day program to delegates from across the country. A conference highlight video and detailed speaker summary are now available on the E-OZ website. The Australian Industry and Skills Committee (AISC) is consulting extensively with industry to remove obsolete and unused qualifications and units of competency from the national register, making it easier for students and employers to find the training that matches their skills needs. Compared to a year ago, the VET system has about 10 per cent fewer qualifications. For example, the Textile, Clothing and Footwear Training package now has 23 separate qualifications, whereas a year ago it had 49. In reviewing their qualifications, the Textile, Clothing and Footwear industry identified the need for a more modern approach to help the industry respond to significant restructure due to decreased tariff protection and increased competition from low cost imports. As a result, there are now fewer, more broad-based qualifications to maximise skills portability. The new qualifications also include skills that better reflect current industry practice, helping the sector capitalise on niche markets, which are on the rise and performing well. To make sure that industry’s training needs are met, the AISC relies on advice from its network of more than 60 Industry Reference Committees which are made up of people with experience, skills and knowledge of their particular industry sector. Last year, each IRC was asked to identify the five highest priority skills for their industry for the next three to five years. Clear areas of commonality emerged, including communication, customer service, safety and risk, technology and business skills. To maximise skills portability – vital in the new world of work – the AISC is looking to develop training package components in these areas that can be used by multiple industry sectors. Some sectors already draw heavily on training packages developed for other sectors. For example, the Transport and Logistics Training Package now imports units from eight other training packages as diverse as Business Services, Health, Construction, Gas, Plumbing, Metal and Engineering. The AISC is working to simplify the VET sector, to increase employer confidence and to ensure increased mobility options for workers, making Australian more productive and competitive. Find out more about the IRC review and the work of the AISC by visiting the AISC website. Australian Council for Private Education and Training (ACPET) welcomes you to the ACPET NSW State Forum on Wednesday 15 March at Dockside on Darling Harbour. Following on from the success of our VET Forum in November 2016, this event is a full day, whole sector forum focusing on issues that affect providers and stakeholders that operate in all spaces of the industry. The Forum runs from 9 am to 5.15 pm followed by an hour of networking drinks overlooking Darling Harbour. Our exciting and prominent list of speakers is headed up by the Hon John Barilaro MP, Deputy Premier of NSW and Minister for Skills, who will be delivering a key note address. Sue Sundstrom, President, Careers Advisor Association of NSW and ACT: Career Advisor conversation insights. Access the program of the day and list of speakers on the ACPET website. The event is priced at $305 (GST inc) for members and $360 (GST in) for non-members. Register for this event or contact Chloe Howard on 02 9922 1124 or at chloe.howard@acpet.edu.au for more information. • RGR Racing Training Packages. View the project. This project will review occupational skill standards and units of competency from the RGR Racing Training Package, ensuring that racing integrity and animal welfare skills and knowledge critical to the industry are reflected in training. Public consultation has now commenced. View the project. This project will review and update occupational skills standards and units of competency from the FWP Forest and Wood Products Training Package in line with current forest harvesting optimisation processes and technologies. View the project. This project will review relevant veterinary nursing units of competency and qualifications within the ACM10 Animal Care and Management Training Package, ensuring they reflect the current skill standards and needs of industry. View the project. This project will review and align existing retail baking units of competency, skills sets and qualifications from the FDF10 Food Processing Training Package, to industry defined occupational standards. View the project. International Women's Day, originally called International Working Women's Day, is celebrated on 8 March each year to celebrate the social, economic, cultural and political achievements of women. Read about three Australian women who are helping unlock women's potential in the world of work. Dayne Robinson’s passion for floristry began at the age of 14, working in a part-time job at a local florist. Since this casual employment, she has gone on to win a gold medal in the WorldSkills Australia National Competition for Floristry and be selected to compete against the world’s best at the 2013 WorldSkills International Competition in Leipzig, Germany. Dayne completed her Australian Apprenticeship and a Certificate III in Floristry through the Box Hill Institute while employed with a small florist in Croydon. She really enjoyed the on-the-job learning environment that her apprenticeship provided and considers herself lucky enough to work in a creative and beautiful work setting every day. Read more of Dayne’s story. Jyothi Foman was on a fairly standard school path to university until becoming taken with the idea of silver smithing on a Year 10 school excursion. Always loving creative forms such as painting, ceramics, woodwork and metalwork, she discovered that jewellery manufacture was a trade and on finishing school commenced an apprenticeship. Travelling to Melbourne eight times every year for three years to attend Melbourne Polytechnic, Jyothi gained a Certificate III in Jewellery Manufacture and qualified as a jeweller. She won silver in Sao Paulo, Brazil in the 43rd WorldSkills Competition and in 2015 was appointed an Australian Apprenticeships Ambassador. Jyothi hopes her story will encourage others to think about what they want to do in life. Read more. Adele Di Bella didn’t see herself completing Years 11 and 12, deciding instead to undertake an Australian Apprenticeship. With a long-standing passion for making cakes, she listened to her instincts, finished school early and enrolled in a Certificate III in Retail Baking (Combined). Adele’s enthusiasm, skills and drive to succeed were rewarded when she was selected as a 2015 WorldSkills Australia Skillaroo. In August 2015, she represented Australia in the 43rd WorldSkills Competition in Sao Paulo, receiving a Medallion of Excellence for her work. Adele was appointed an Australian Apprenticeships Ambassador in 2016 and considers the opportunities that have come to her so far as a dream that has come true. Read her advice for anyone considering an Australian Apprenticeship. If you would like to provide feedback, supply an article for inclusion in the next edition or join our list of subscribers, please email skillsatwork@education.gov.au. The next edition will be published in April 2017. Submissions are due by Friday, 17 March 2017.